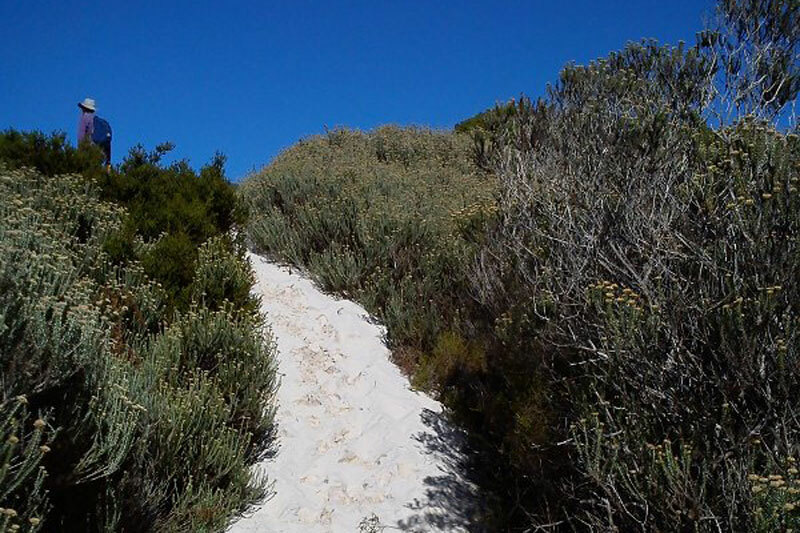 Most people get to Peers Cave, above the dunes of Fish Hoek, in a fairly dignified manner, albeit a steep one. There is, after all, a fairly logical and easy to find path hewn for hikers that leaves a parking lot on Ou Kaapse Weg and takes you up to the cave in oh, say twenty minutes. I know only because this was our journey back down. Our trek to the cave was a little more arduous as our hike leader, bless him (he really is a very nice man), thought that a bit of a bash through the bundu might be in order, and so we ventured forth to find the cave from the parking area at Silvermine, on the left just past the turnoff to Noordhoek, in order to come at the cave from behind the ridge. It would have been a lot easier simply to go at it the way we later descended. 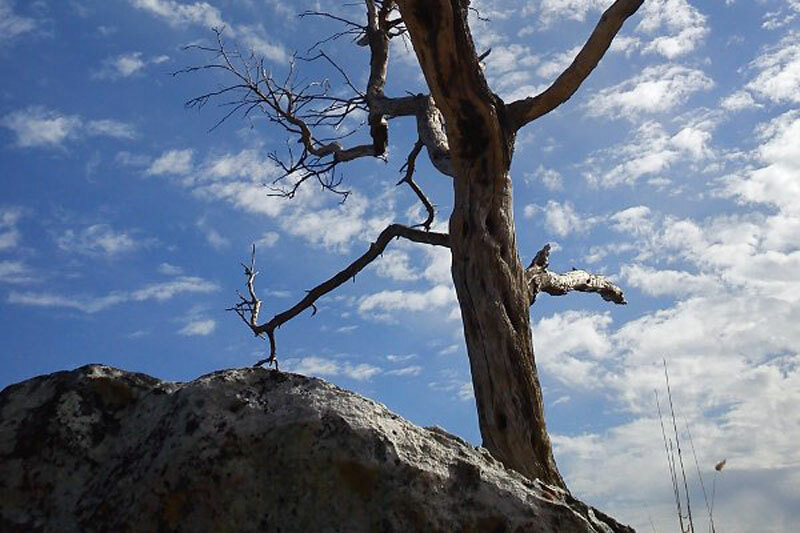 But then again, we would have missed out on all that journeying up and down sand dunes and the incredible views overlooking the Clovelly golf course beyond, whilst trying vainly to find the path. And the kids absolutely loved finding the tags left for us by what must have been an orienteering group that helped a little, but still had us leaping past and over boulders and across the debris left by those who had been paid to cut down everything vaguely invasive in the vicinity. Peers Cave was simply beautiful, when we did finally find it. It isn’t really a cave in the sense that you get deep inside a hole with only a smallish opening from which to view the world beyond. 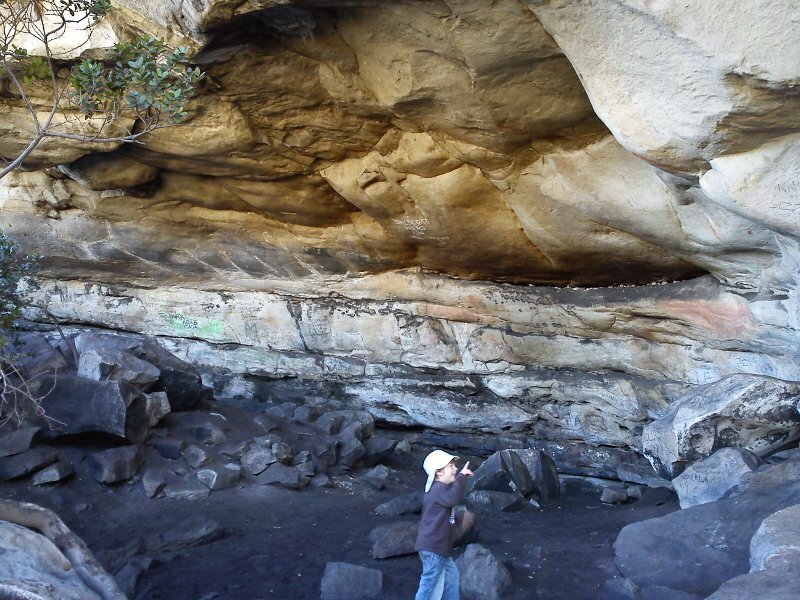 Rather it has a huge overhang and is almost hewn into a series of incredible rock faces that provide a large space in which I can imagine the Khoikhoi of yesteryear lighting fires and generally going about their business. 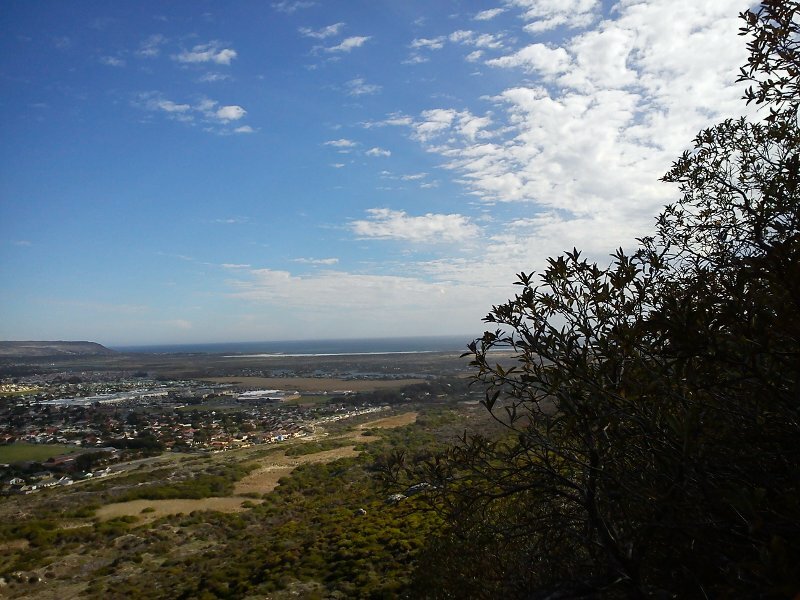 It is also well protected from the north easterly wind by a projecting roof, and the views out over Fish Hoek, Sun Valley and beyond are fantastic. We sat a while to eat our sandwiches, and drink a cup of tea whilst discussing this and that in avid detail, the youngsters pretendeding to be the explorers that amateur archaeologist Victor Peers was when he uncovered fossilised remains here in an ancient burial site in 1927. What we didn’t realise is that apparently just above Peers Cave is a further cave known as the Cave of Ascension, supposed to be a ritual cave of fertility and rebirth, and held as sacred. But Peers Cave is fascinating if you start reading up about it. The first thing excavators realised, upon discovering sea shells in the cave and taking into account the position of the cave midway between the Atlantic and Indian Oceans, is that the sea must have come a lot higher in the days when the cave was in use. Particularly as these shells are only found some 3 miles into the ocean today. Peers and his son weren’t the first people to try and excavate in the cave, and previous explorers apparently did more than a fair bit of damage. 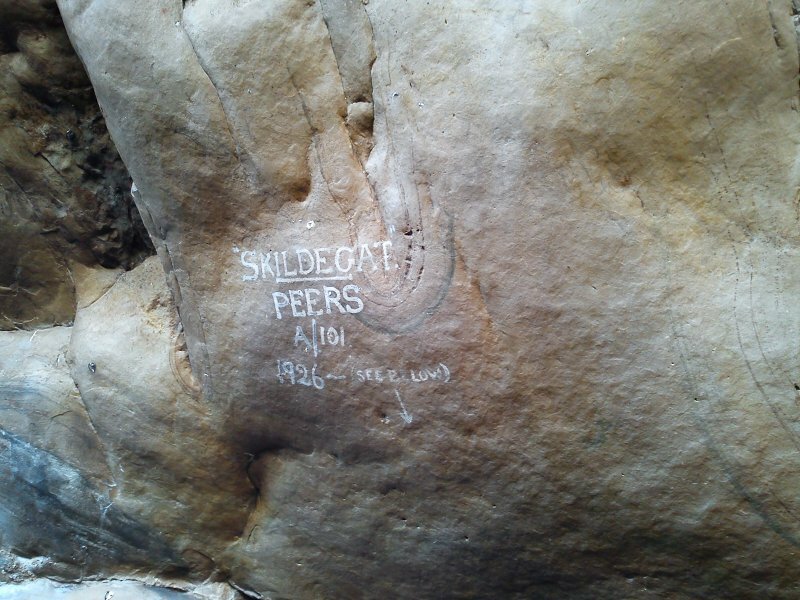 What the Peers did uncover was bored shells, pieces of human bones, bits of rope, beads made from ostrich egg shells, ornaments and arrow heads, which meant that the cave had been used by Strandlopers (beach walkers) – Khoisan who spent their time combing the beach for food along the south-western African coast. The highlight to the Peers’ excavation was the discovery of a blackened skull, the bone structure of which was traced back to those who roamed the coast some 15 000 years ago (some accounts say 12 000). This skull in particular is the largest brained type discovered yet. There were also three adult skeletons found in the back of the cave. These remains had excellent teeth which led to the interesting proposition that the burial was probably made after early Portuguese explorers made it to Cape Town and that they were not Strandlopers at all. As our hike leader imparted some of these details to the boys and they sat big-eyed, their hands already itching to begin scratching in the almost black sand at our feet, I cast my eyes out over the valley beyond and tried to imagine a time when there were no houses, roads, cars and development; when the sea was a lot closer, close enough to nip out of the cave and down to the shore to stock up on fish and shells; when life in general was left undisturbed and when nature, not the needs of man, dictated when and how life was spent. Not that I have any romantic delusions of life in a cave. I was quite happy to make my way down to a motorised vehicle, which would get me back to my snug home a whole lot faster than a jog along the beach would have. 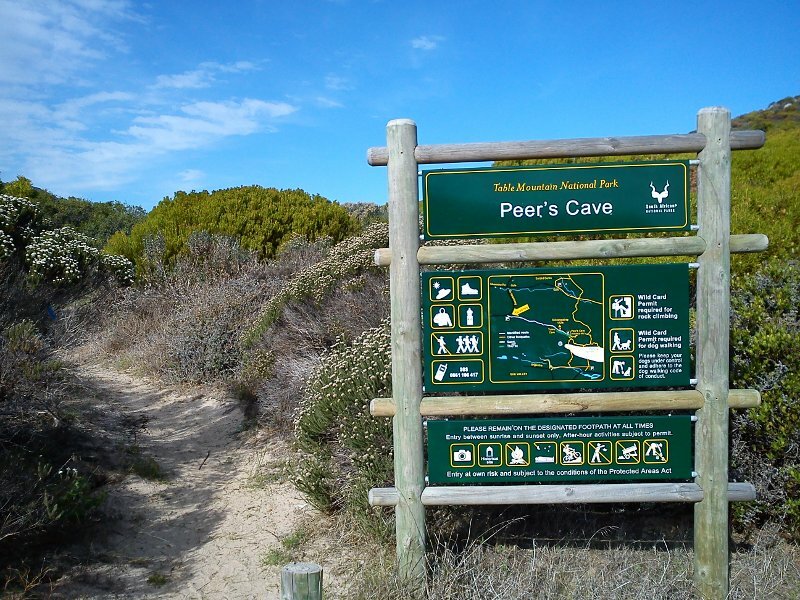 You can reach Peers Cave from either Fish Hoek or Ou Kaapse Weg. Drive up from Sun Valley heading in the direction of Cape Town and find the signboard to Peers Cave to your right in a small layby, or park the car off the road at one of the alternative Silvermine parking areas, to the right just before the San Michel Estate, Noordhoek for a longer haul.